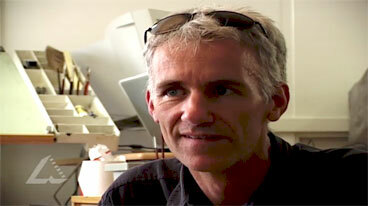 Video clip synopsis – Cartoonist David Pope talks about the creation and influence of political cartooning. Broadband MP4 dpope1_bb.mp4 (7.1MB), suitable for iPods and computer downloads. Talkback Classroom is a forum program run by the Education section of the National Museum of Australia. Each year, panels of three secondary students selected from schools Australia-wide interview leading decision-makers on important current issues. The panels participate in a ‘learning journey’ (researching the issues and developing interview skills) to explore the issues and prepare for the forum. In 2007 a forum on the topic of 'Political Satire’ was held. The guests interviewed were John Safran, SBS TV/Triple J radio presenter and Canberra-based cartoonist David Pope. The interview panellists were ACT students Kirrily Howarth (Yr 12 St Francis Xavier College), Samantha Bobba (Yr 10 Lyneham High School) and Wil Francis (Yr 9 Belconnen High School). In preparation for the forum, students participated in a learning journey that involved interviewing Australian cartooning icon Bruce Petty and Joe Hockey, Shadow Minister for Health and Ageing. Australia has a rich political history. A significant part of this history is political satire; this allows society to see the ‘underbelly’ of the political process and to gain insights into governmental behaviour and decision-making. Political satire in Australia is most often seen in the form of cartoons or television programs. The first political cartoon published in an Australian newspaper appeared in 1835 in the Cornwall Chronicle in Launceston, Tasmania. Many of Australia’s major newspapers continue to feature political satire cartoons as part of their daily editorial. With the arrival of television in Australia, political satire soon moved into this medium in the form of shows such as The Mavis Bramston Show, The Games, The Glasshouse and The Chaser’s War on Everything. Many contemporary topics are covered by political satirists. Climate change, terrorism, economics, the environment, elections and government ‘indiscretions’ are often targets for political satire. Often the satirists will interpret a topic in such a way that will expose the real substance of it, frequently allowing people to gain a better understanding of the topic and to be better informed. Political satire performs an important role in Australia’s democratic society; it is a potent device that can expand awareness of the matters that affect all Australians. Working in small groups, make a list of the roles that cartoons may play in contemporary society. Compare the various group lists. Which roles were consistent? Choose one role and examine how cartoons can fulfil that role. Look for any roles that haven’t been identified by any of the groups. Choose one of those roles and examine how cartoons might fulfil it. Cartoonist David Pope refers to the ‘changing media’. What do you think he means by the ‘changing media’? What is changing and what effect are those changes having in regard to the way cartoons are produced and ‘consumed’? Stage a class debate on the topic of ‘Cartoons don’t change people’s minds’.